Real Advisor Realty is a premium real estate company serving the Rivermark community. Rivermark community is located in the heart of Santa Clara County, in the city of Santa Clara. Rivermark is master planned community that consists of six developments, built by three builders Centex, Shea and Lennar Homes. 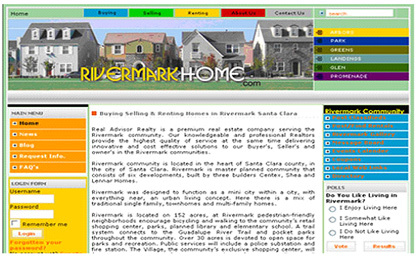 Rivermarkhome is developed on Mambo, a widely used content management system. Many addons are used to provide extra features viz blogs, classifieds, event management system, coupon system, message board/Forum, Gallery etc. Friendly admin panel is provided to handle the mentioned features.